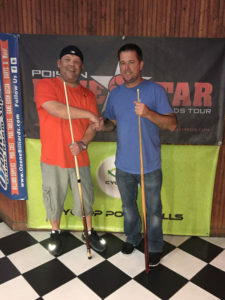 Will Felder took down the Poison Lone Star Billiard Tour’s amateur 9-ball division, winning his first amateur title since 2013, while Manny Chau secured his third open division win this year. Felder faced off with Brian Rosenbaum, losing the first set of the true, double elimination final, 5-4. Following a first round loss, Rosenbaum came back to win an astounding eight matches to meet Felder in the finals. In the second set, Felder overcame Rosenbaum, ending his streak, and clenching the division, 5-4. In the open 9-ball division, Manny Chau took a third round hit, and won eight in a row to meet hot seat winner, Chase Rudder, in the finals. Chau overcome Rudder in both sets, by the same score, 7-2. On Saturday, August 26th, 2017, Hurricane Harvey’s torrential downpours inundated the Houston area. Due to the potential for flooding, this Poison Lone Star Billiards Tour event was concluded in one day, instead of its customary two days, to ensure players would not have to brave flood waters on Sunday. Bogies West in Houston, Texas, hosted another first-rate event, along with tour title sponsor Poison by Predator Cues PoisonBilliards.com, and sponsors Cyclop Pool Balls facebook@CyclopPoolBalls, Ozone Billiards OzoneBilliards.com, APA of North Harris County facebook@APANorthHarrisCounty, OutsvilleBilliards.com, and Realtor Jimmy Jenkins. 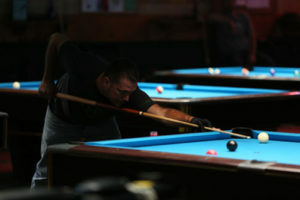 As the winds kicked up on Saturday, the amateur and open 9-ball divisions kicked-off. In the amateur 9-ball division, Felder fended off Brian Humphrey, Pablo Trinidad, 5-1, and newcomer Foots Ferguson, 5-1, while Lake Jackson’s Jason Galetka ousted Randy King, C.J. Escalera, 5-1, and Chuck Adams, 5-4. Sonny Bosshamer bested James Costello, Jerry Cook, 5-4, and David Chow, while J.C. Torres sought to defend his title, blazing through Shelby Green, Viet Do, 5-3, and Alan Myers, 5-3. As the final four on the winners’ side took shape, the one loss side was full steam ahead. Brian Rosenbaum took a first round hit, and came back to win eight matches, securing wins over Cook, 5-1, Alan Martin, 5-0, and Ferguson, 5-0. Myers eliminated James Costello, 5-2, Green overcame Chow, and Rivera eliminated Adams, rounding out the final four players on the one loss side. On the winners’ side, Torres made quick work of Bosshamer, 5-1, while Felder slid by Galetka, 5-4. On the west side, Rosenbaum booked his third 5-0 victory over Rivera, then ended Bosshamer, 5-4. Myers defeated Green, 5-3, but fell to Galetka, 5-4. East side action witnessed Felder secure the hot seat over Torres, 5-3. Rosenbaum made his way to the finish line, eliminating Galetka and Torres, by the same score, 5-4. Felder prepared for what he knew was going to be a tough battle. Rosenbaum added an eighth notch to his tournament belt, besting Felder in the first set, 5-4. A resilient Felder stepped back up to the plate, and came with it, ending Rosenbaum’s run, 5-4. Congratulations to Will Felder on another long-awaited title! 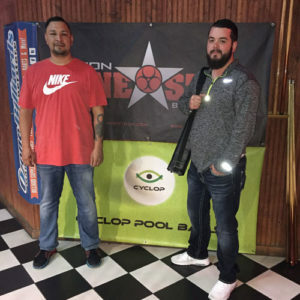 In the open 9-ball division, Chase Rudder was on his way, logging wins over Will Felder, 7-2, and J.C. Torres, 7-0, while Waco’s Doug Young overwhelmed Jason Galetka, 7-2, and Foots Ferguson, 7-1. Brian Rosenbaum defeated Brian Humphrey and David Chow by the same score, 7-5, while Ernesto Bayaua hit Erik Renteria, 7-2, Manny Chau, and Alan Myers, 7-4, finalizing the final four on the winners’ side. Following a second round blow at the hands of Bayaua, Chau came back to win a total of eight matches, including wins over Viet Do, 7-1, and J.C. Torres, 7-1. After a first round upset at the hands of J.C. Torres, Richie Richeson came back to win three in a row, eliminating Shelby Green, 7-6, Humphrey, 7-2, and Ferguson, 7-3. Felder made a run, taking out Marcus Flores, 7-6, and Alan Myers, 7-6, while Tom Rehm powered through Erik Renteria, C.J. Escalera, 7-4, and David Chow. Down to the final eight, on the winners’ side, it was Rudder over Young, 7-3, and Bayaua over Rosenbaum, 7-4. Rudder went on to defeat Bayaua for the hot seat, 7-2. On the one loss side, Chau rolled over Richeson, 7-0, and Rosenbaum, 7-1. Felder ended Rehm, 7-6, but fell to Young, 7-5. Chau overcame Young, and Bayaua, 7-0, to meet Rudder in the finals. Needless to say, Chau was on fire, blasting through Rudder the first set, 7-2. In the second set, Chau soared to the finish line, 7-2. Congratulations to Manny Chau on his win, and third open division title of 2017. The tour would like to recognize its 2017 sponsors and venues: Poison by Predator Cues, Cyclop Pool Balls, Ozone Billiards, APA of North Harris County, Outsville Billiards, and Realtor Jimmy Jenkins. This year, the tour welcomes back Texas venues Bogies Billiards and Sports Bar (Houston), Bogies West (Houston), Skinny Bob’s Billiards (Round Rock), and brand new venues, Fat Racks Sports Bar and Billiards (San Antonio), and CK Billiards (Dallas). Without the nearly 300 players who attend Poison Lone Star Tour events, annually, production of this tour would not be possible. The tour would like to thank each and every player for their participation, whether it’s one event, or every event year round. It is because of your patronage, that the Poison Lone Star Billiards Tour celebrates its 9th birthday this year, serving players across Texas and in surrounding states. The tour welcomes everyone back for the next event, to be held on September 30th-October 1st, at Bogies Billiards, 3040 FM 1960 E., in Houston, Texas. The full 2017 schedule is published at www.LoneStarBilliardsTour.com. The Poison Lone Star Billiards Tour encourages everyone who loves to play pool and compete in a friendly atmosphere, to attend an event. “Like” us on Facebook @LoneStarTour and “Follow” us on Twitter @LoneStarTour09.